The message has a lot of recipients in [To], [CC] and/or [BCC] fields, but the message will be sent to ONE receiver per time. Each contact will ONLY see his/her eMail address at the [To] field, and no [CC/BCC] recipient will appear. Each receiver will see his/her name in message subject and/or content. Usually, it is used to send the personalized newsletter, greeting and/or eMarketing messages, and it makes your email friendly with high delivery rate. 1. Fill only ONE receiver to the [To] field. 2. Write the name of above receiver and other words in [Subject] and/or [Content] area. 4. Repeat 1~3 many times relied on the number of contacts. In AMSSE, it is smart! Only need to insert the macro(s) under “Recipient information” category to the subject and / or content of your message, and check the “One-by-one mode” setting, our mailer program will do the hundreds of manual writing and sending for you. Screenshot: auto send mail with obo and macro features. It works for manual and automatic sending modes both. To use the recipients information related macros better, please write the display name for each receiver in Name format, if you use the recipients file or import the recipients from file, AMSSE will guide to make the right format for display name and email address, it’s not difficult, just follow the wizard of our mailer program. 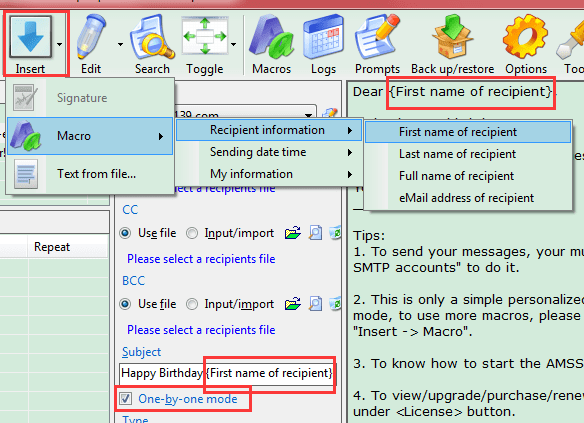 If you have not specified the display name for the recipient, our auto sending mail program will get the name information from email address for the macros, also work, but not friendly. For more details about macro, please read this article. Download AMSSE to Auto Send Mail!